1 tablespoon grated cheese, preferably grano padano or another hard cheese. 1 tbsp chopped herbs. cilantro, basil or the like. Cut the mushrooms into strips. Cut the onions into thin strips. Fry them well and put them aside for later. Clean the pan for any nasty bits that will make the egg look dirty. Mix the two eggs. In a bowl, or a shaker. Put the salt into the eggs. I prefer to shake them in the shaker. Fry them like a pancake (crepe style), so that they fill the entire pan. When they begin to stiffen put the filling on one half of the omelette. Keep the edge free. Fold the unfilled half across the filled one. Brown on one side first and then the other. That way the eggs will stiffen and glue the two halves together. Which will provide the omelet with a golden delicious crust. When I was growing up in Denmark an "omelet" [sic] was more like a Soufflé. The egg yolks were mixed with stiff whipped egg whites. Fried in butter and served with jam. But I'm not aware of how many people know this variation. You can use anything you like as a filling. Sausage in strips or thin slices. Bacon strips.Chicken meat. Fried vegetables. Eggs are also suitable for sweet things, fruit, or 1 tablespoon jam is also good. You can fill an omelet with about ½-1 cup (1-2 dl) of filling. Try to settle for only ½ cup (1 dl) until you have mastered it. If it is too full it breaks easily. 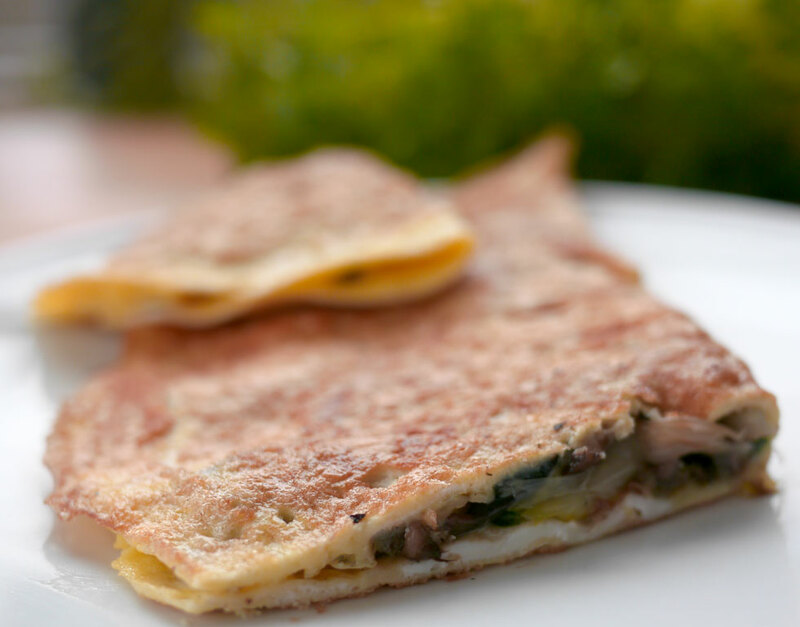 You don't have to put stuffing in an omelette. 1 tablespoon of fresh chopped herbs is also really good. Can be eaten alone or on a slice of bread. In Denmark we usually put it on a slice of wholegrain rye sourdough bred.